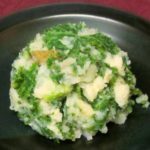 When I started looking around the blog world – interacting with people in groups, reading other blogs, and so on – I was astonished by how few people seemed to be eating potatoes as a staple. Especially how few people who were gluten free ate them regularly. I mean – I grew up in a “meat and potatoes culture.” My family was weird – my dad hated mashed potatoes (my mom thought it was the result of too many bad restaurant meals, before marriage and while traveling) and wasn’t particularly fond of others, and so we almost never ate them, but that was unusual. Most people we knew ate potatoes at almost every dinner. 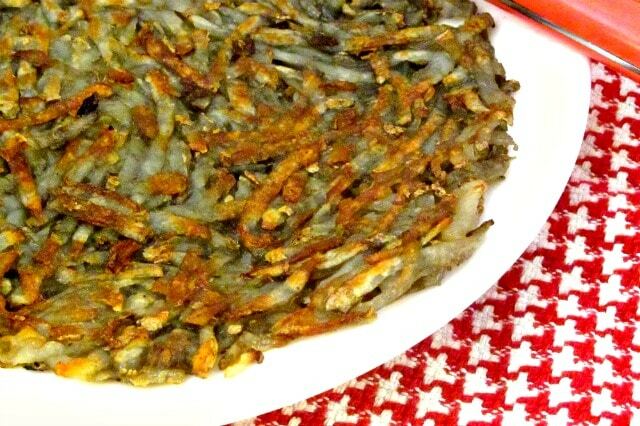 Vast numbers of potatoes are still eaten- but in the form of French Fries, instant mash, and frozen hash browns. But every step we add between the potato and the plate radically increases cost, and frequently decreases nutrients. 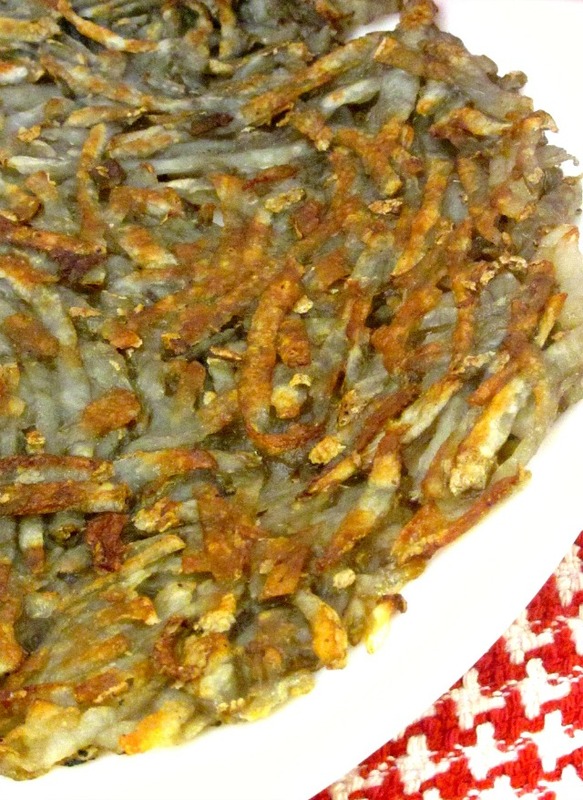 Looking around other blogs, and cooking groups, and Pinterest, I’ve been amazed how many recipes call for frozen hash browns. They’re usually just shredded potatoes. So far as I can tell, several at least of the frozen commercial hash browns available in stores do say they are gluten free – and so should be perfectly safe. But there is always some risk of accidental cross contamination – such has happened with other products. More to the point, for me, they cost several times as much as fresh potatoes, and they take up valuable freezer space. 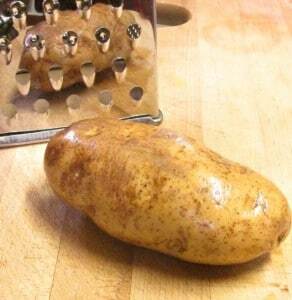 It is not that hard to grate a potato. Now – this step is optional, if you’re in a rush, but it will improve them. Once the potato is grated, salt it lightly, and mix the salt in. 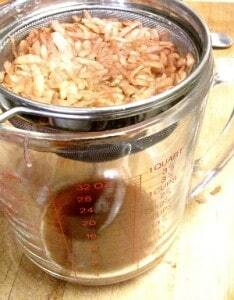 Then put it in a strainer, and let the liquid drain a while. 10 minutes will make a difference – 20 or more is even better. Basically this keeps it from getting soggy in the pan – and also gives the salt a chance to flavor the potatoes. If you want, instead of using a strainer, you can put it all in a clean dish towel and wring it out – I find the strainer easier on my hands. Oh – the potatoes do discolor slightly – that’s just oxidation, like an apple. It doesn’t really show when you cook them, but, if it bothers you, you can add a dash of lemon juice. The traditional way is to drop them in cold water, but that won’t help dry them, now will it? Take a good heavy fry pan, heat it up, and grease it. Now – usually I use oil for a pan, but if you want that pretty golden browning action, butter works better… On the other hand, you have to watch it more carefully to avoid burning. So let the pan heat over low heat about five minutes, to get the heat good and even, while you use a spoon to press out the moisture from the potatoes. Then melt butter in the pan, and put in the potatoes. I spread them out to get a nice thin crisp layer – if you prefer, or you are simply making too much to do that, you can make a thicker cake. At this point, keep the heat low, and cook it until the potatoes are mostly cooked through. For this thin layer, that was only five minutes, for a thicker patty it could easily be ten or even a little more. Don’t cover the pan – that holds in steam, and, while it does speed things up (so I guess you can if everyone is hungry!) it also makes mushy potatoes. 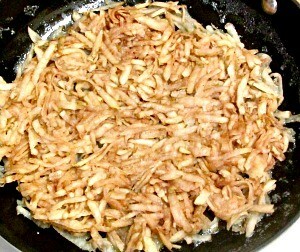 Once the hash browns are mostly cooked, raise the heat to medium to brown them. At this point, keep a close eye on the pan – this is the stage when the butter can burn (and I know this because… ) After about five minutes, flip the potato patty over – I find it easiest to slide it onto a plate and then flip it back into the pan, but if you can use a spatula without breaking it (or just don’t care…) go for it. Then give it another five minutes on medium – though if you have a thicker patty, you may want to do that, and then lower the light for another five until you are sure the potato is fully cooked. Yes – I keep giving variables – I want you to be able to cook this for just yourself or for a big family, and amounts affect timing. 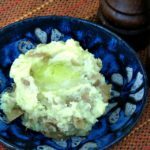 Now – if it really does make sense for you to have the frozen – say, you need to be able to throw the meal together super quickly – you can grate, salt and drain the potatoes and then freeze them yourself. In that case, you may as well do a big batch in a food processor (or rope in assistants to handle the grater!) Drain it initially in a strainer, and press, but then do add the step of wringing it out in a clean dish towel – you want to remove as much water as possible before freezing, as water in the potato affects the texture and makes it mushy. Then spread it out on a baking sheet, freeze it for about an hour, and transfer into a freezer bag. Sorry, no demonstration pictures – I just do not have the freezer space right now… And then, since you are in a rush, you may want to cook little individual patties, instead of one larger cake. For me, that feels fussy, but it may work for someone in different circumstances. So there you are. 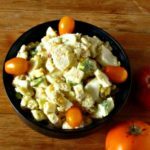 The most complicated part is actually the cooking – which you have to do with many frozen versions anyway. Other than that, you can decide for yourself how much fuss you want to put into it, and whether or not you find the results worth it… and even the most complicated version is really pretty simple. 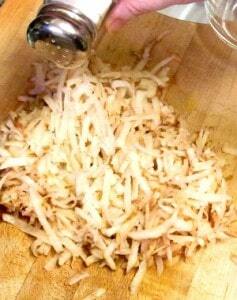 Homemade Hash Browns - easy and very inexpensive to make at home, with total control over quality. Optional step (which helps texture) - sprinkle potato with salt, mix well, place in a strainer to drain liquid away. Let drain from 10-30 minutes, as is convenient for you. Heat a frying pan over low heat until evenly heated. Melt butter in the pan. Add grated potato, and spread out into a patty as thin or thick as you want. Cook over low heat 5-10 minutes, until potato is mostly cooked through. Then raise the heat to medium, to brown it, about 5 minutes - watching carefully to be sure the butter does not burn. Flip potatoes in the pan to brown the other side - again, about 5 minutes. If they are not yet fully cooked, now lower the heat and let them cook until done.